OCEANSIDE — Hair restoration has come so far in the last decade that the tell-tale signs of procedures no longer have to be par for the course. The invention of Follicular U nit Extraction, or FUE, is one of the most exciting advances in the history of hair restoration, and it has a multitude of benefits including the absence of a linear scar line, fast healing, minimal discomfort and natural looking results. 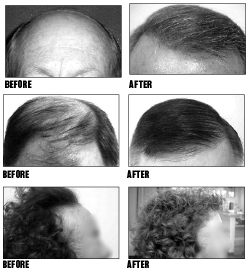 FUE differs from the traditional Follicular Unit Grafting, or FUG method, in which long thin strips of scalp are extracted. “The FUE hair transplant is relatively new, and among its notable benefits are that it is minimally invasive and there is no linear scar,” Dan Wagner, CEO of MyHairTransplantMD said. While the FUE procedure can be done via robot or computer, it can also be performed by highly skilled surgeons, which is the difference between MyHairTransplantMD and its competitors. The first step in the FUE technique is to remove follicles from the donor area. The hairs are extracted in their naturally occurring one-, two-, three- and four-hair follicle units from areas of the scalp that are resistant to balding. They are then transplanted into tiny incisions in the balding areas. The extracted hairs are then examined to assess their integrity and suitability for transplantation. “These grafts are then meticulously placed at the correct angle, direction and pattern of your original hair,” Wagner said. This is in contrast to FUG, which has a longer 14- to 30-day recovery time. Additionally, it’s ideal for clients who prefer to wear their hair short and would feel prohibited by having a linear scar. “The tiny circular marks where the donor hairs have been extracted are usually undetectable,” Wagner said. If you have been considering hair restoration and want to learn more, visit myhairtransplantmd.com or call (800) 262-2017 for clear procedure pricing, more testimonials, and a complete comparison between FUE and FUG methods of hair transplantation.